The church of St. George at Brinsop is one of England’s 1000 best churches. 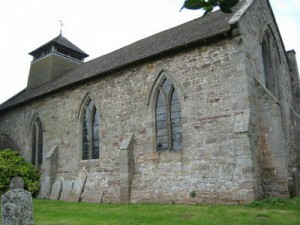 In 1867 the 13th century church was re-opened after extensive renovations by Messrs Welsh and Son of Hereford with the supervision of the Architect Mr. W. Chick. It seems that prior to this renovation, the building was in a severely delapidated state; the stone floors were damp and the wood rotten, whilst the walls were crumbling with decay. More worrying was the fact that the timbers in the belfry were so rotten that that area was completely unsafe. However, following the work, this little church was transformed with even the original font being carefully restored.